For hundreds, if not thousands of years, beer was the only safe thing to drink. Almost everyone drank beer in one form or another but they didn’t know why it didn’t make one sick and water did. The beer was being boiled and that simple step killed the pathogens in the water that made us sick. It wasn’t until the mid 1800’s when we fist began understanding microbiology. Pasteurization is just one more gift that beer gave to civilization. Slowly, water became safer and the number of breweries declined. This graph was released recently by the Brewers Association and went a little “viral” in beer circles. As a beer lover, it should bring you joy. In your face, 1887. 2012 rules. Prohibition had its impact as represented on the graph. As a sidebar, one could suggest that based on the graph, prohibition had no long term impact on the number of breweries in the US. It appears if you connect the dots between 1920 and 1933, the downward trend would have remained constant. Then enter the dark days of 1978. I was three years old, so it didn’t bother me too much. If you lived in the bay area as a craft beer fan back then, you may have survived insanity with Anchor and New Albion — maybe Yuengling got you by in the east and Shiner in Texas. 1978 also saw the “legalization” of homebrewing, so I’m going to credit that to the rebirth of American beer. Yes, the word “legalization” just got quotes. Due to a clerical error or omission in the 21st Amendment, home wine making was legalized and home beer making was left out. I think I’m suggesting that if the lawmakers in 1933 didn’t have their heads placed up their — you know whats, American Craft Beer would have hit its stride years ago. But then the west coast hop bomb craze may have hit in the 60’s! We are here now, so hooray beer! Nationally, 725 breweries were being planned this time last year. Compare that to 1,252 today and you can see this crazy train isn’t stopping. One of those 725 from last year was our own Humboldt Regeneration. “Wait a minute……” you say, and begin counting the Humboldt breweries with your fingers. “Let’s see here, Mad River, Redwood Curtain, Eel River……..” Lo and behold, your Humboldt brewery count just went to your second hand. Six Humboldt breweries now exist. Six. That’s one more than five. Hopefully you have read the previous HumBrewNation post about Humboldt Regeneration CSB and its goal to make a 100% Humboldt ingredient beer. Since then, HRCSB has become a bona-fide, card carrying, beer making, tap room having brewery. Brewmaster Jacob Pressey is set to launch his growler exchange program on August 27th. You can get Humboldt farm fresh beer with a one month share for just over $4 a pint. Thats $66 for a once a week growler fill for a month. 3 month and 6 month versions are also available. HRCSB is still working towards that 100% Humboldt ingredient goal and it won’t get there without you. Get yourself down to the brewery located at 2320 Central Avenue Unit F in McKinleyville on August 27th to help him make this a success. You don’t have to wait to taste it, you can go enjoy the beers now in the tasting room Sunday through Tuesday, 10:30-6:30. Jacob is cranking out brews on a 1 bbl nano-brewery system using ingredients grown on a small farm in Alton. I think we would all like to see it become a microbrewery supporting acres and acres of sustainable farming. That is something everyone can get behind. 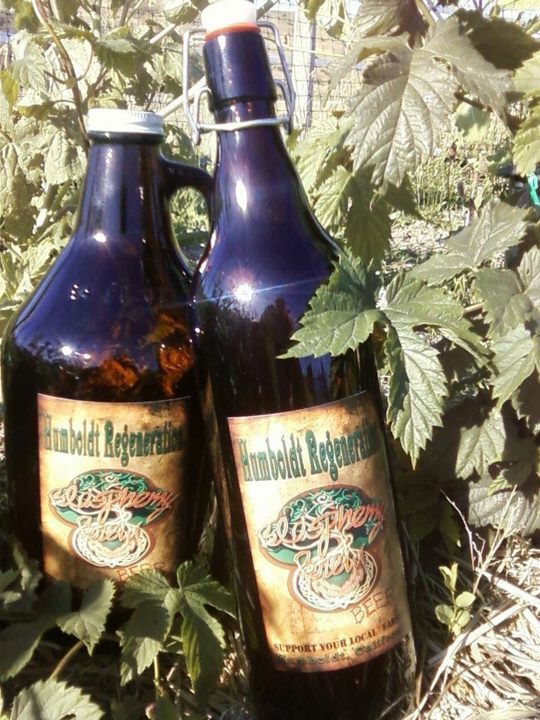 Get all the info about Humboldt Regeneration on their website. Get ready to count out those breweries on your hands again. Rumors of #7 are swirling…………. If you have a story or a question about an upcoming event or would like to add an event to the calendar, email me: HumBrewNation at gmail dot com.